I am kind of crazy today. I found my cds (they weren't really lost, just upstairs, in the office, where I never remember to go, and since I am still halfway healed, once I come downstairs I don't want to go backup again anytime soon) and spent the second half of the day sitting downstairs listening to music really loud, making cupcakes (see previous post) and talking to Puff and feeling kind of nuts. Anyway, I love Deb's blog, Smitten Kitchen, which I've said before, if you don't know if you should, she takes beautiful photographs and has wonderful recipes. 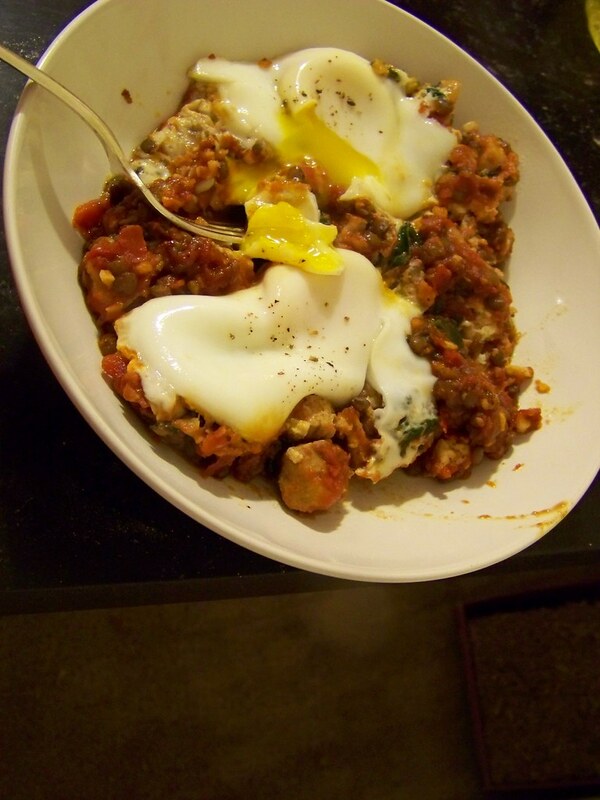 Anyway, she wrote about a delicious, easy, fantastic looking meal of eggs in tomato sauce. I meant to make it, and then forgot. I know it was only a week ago, but I still forgot. Leave me alone. So tonight I sent Alex out to get me some tomato puree so I could make this. He was heading out to a "beer tasting" which I'm pretty sure is just a fancy sounding way to say "getting wasted with the boys" but who cares. Let him pretend to be grownup. He came back with two things of chopped tomatoes, and one of crushed tomatoes, which were close enough. He also had bought some pork chops yesterday, and we had spinach leftover from the other night. I wanted to mix everything together. But I wanted to add lentils. I've been craving little french lentils, which I usually put in my ragu, but I didn't want to make ragu again. So, I combined everything. And wow, was it good. And filling. And healthy! See that Mom! And Dana! I eat healthy things sometimes! ...After cupcakes. Put lentils in a small pan with enough water to cover, and a pinch of salt. Bring to a boil, and simmer, adding water as needed, until tender, about 15 minutes, maybe more. Cook your tomato sauce. Season your pork with salt and pepper, and heat up 1T olive oil in a pan. When hot, add garlic, cook 1 minute, then add pork pieces. Cook until no more pink shows, then dump into the pot with the tomato sauce. Keep that pot covered and simmering on low. You may need to add some more liquid in a little while. Cook 15-20 minutes, until the pork is tender and the lentils are totally done. Dump the lentils into the tomato pork sauce. Heat remaining olive oil in the pan you cooked the pork in, add the garlic, and cook 1 minute. Add the spinach, and cook until wilted. Dump spinach into the tomato lentil pork pot, stir, bring back to a simmer, and gently crack your eggs into the pan on top of the sauce. Cover, cook 5 minutes, sprinkle with cracked pepper, and enjoy. I made this but stuck half of it in the fridge for Alex tomorrow to eat for breakfast, and simmered my half and ate 2 eggs. It filled me up so much that I don't want another cupcake.